I drove the 45 minute journey to Guildford from where I reside arriving at the Holiday Inn about 7:45 am. I wished to meet with many of my American customers, and also friends from Australia and New Zealand. These people have emailed me to tell me they were coming to the event. I saw a smiling face across the room and as I got closer I was excited to meet Betsy Teeter (Legendary Arabians, Bakersfield, CA). Then I was greeted by Coralie Gordon from Australia, who introduced me to Jacquie Webby from New Zealand. Jacquie has written for my magazine but I have never met her in person. I had been to Coralie’s Cameo Stud in Australia in 1990. Then I met Sharon Byford-Ruth and Carol DiMaggio, all Crabbet Influence magazine customers who I speak to often on the phone and via emails. We, along with Betsy, sat for a cup of tea and toast, chatting about our excitement over the event. After breakfast, those who had scheduled to tour Crabbet Park boarded the bus. Later on, after people returned from the visit to Crabbet Park, many told me they enjoyed seeing the house and orangerie, but the common feeling was of sadness at the state of the coronation stables and to be told that there will be further encroachment onto the grounds (meaning developers will most likely turn the grounds (not the main buildings) into a parking lot for Gatwick or some such commercial entity). Some viewers felt the tour was rather rushed and would have liked more time to walk around. But they all said it was worthwhile. One attendee, who is British and an elderly breeder said she felt it was a mistake to take people to Crabbet as it should be remembered as it was in its prime. I did not receive any material of the final schedule so that I could report to you what was included in the literature given to the guests. I later viewed Carol DiMaggio’s folder package to note there were some sales lists on various studs, a sheet to order the video being produced (£25 for US video, £30 for PAL video and £30 for a DVD version), a very nice Convention Catalogue, and the schedules all put in a folder. The Catalogues were not actually available to purchase until Saturday. Some did arrive later Friday evening during the cocktail party. They must have been hot off the press because the solid blue cover rubbed off on people’s hands. It was then that I was told by Caroline Sussex that I could not be sold a catalogue until the next day Saturday. I found it rather disappointing to not be able to obtain a copy until the next day even though I had the £12 handy Friday night. It appeared that the convention guests all had one. Friday evening was the cocktail party. There were quite a lot of people gathered to eat nibbles and have a drink. I did my best to ‘mingle’ and thereby met many of the Australian group that had traveled for the event. Several people were there that I knew via years of correspondence. Mary Lockwood, who resides in Argentina, is a friend who I finally met face to face this evening. People shared with me their enthusiasm for the convention and their feelings about their visit to Crabbet Park. Pictured above is the Australian group. Saturday Sept. 21, 2002 the day of the Horse Parade. 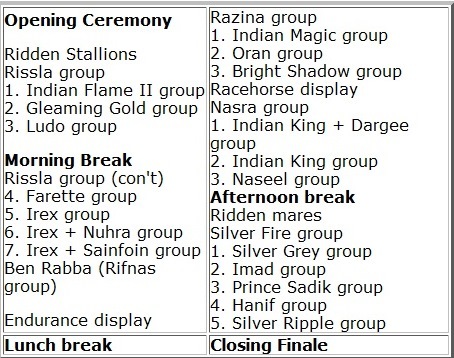 In the catalogue there is a listing of the order of the day and presentation of horses in groups. From my viewpoint, which was in my trade stand, I could see horses coming into the arena, but my understanding of their identity was limited, partly as I could not fully concentrate on the announcing when I had customers in my stand. I did during my quieter moments take a few photos, for which you will see. The spectators to my rough count numbered around 300 plus. I was told there were over a 100 horses on display throughout the day. As I was not in the stands to watch the parade of horses, and had limited acknowledgement of the running dialogue given by Peter Upton for the horse groups, and Alistair Leslie for the ridden groups, I cannot comment on the entire event. From my queries to people who did watch I got a wide range of answers. Most people very much enjoyed the horse groups, seeing the similarity within each group and of course if they had a personal connection to the group, this pleased them more. Some people I spoke to from Australia feel that although there were some outstanding indivduals, overall the British Crabbets were not as good as what they are used to seeing in Australia. What exactly does that mean? I gather it to mean that due to the fact Australia has so many more Crabbets (in numbers), that in comparison, Britain has less outstanding ones. One Australian told me he was disappointed in the overall quality. Perhaps the limits in breeding have to do with the lack of other existing pure Crabbet lines to infuse the blood in Britain. But most knowledgeable breeders in the UK do know that it is relevant to bring in blood from Australia, sadly though, no one currently has done it, since Ralvon Pilgrim and Ralvon Elijah came to the UK, and Mrs. Murray brought Bremervale Emperor, who is now 27 years old. I have to say that I am relying heavily on the professional video that is to be made of the day with the sound embedded in it. This I see in the adverts when purchasing should take a month or so to be ready. I have ordered the DVD version. Perhaps then, in the sanctity of my home, I can fully watch and appreciate the horse parade in its entirety. 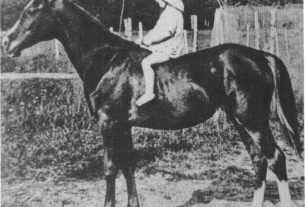 What I do know is that there were many attractive horses, of all age ranges that attended. Some from great distances (Scotland and Ireland) just for this day. This shows the strong belief in the purpose of the Convention, because in this country in particular, transportation costs are extremely costly. Petrol for your car is nearly $5 US per gallon! I will have photos on line but again, I was unable to take many of individual horses and could not identify them as they had no numbers or names on them. You would have had to caught the introduction from the beginning or waited until the last horse was presented, as then the announcer went over the names one by one as they began to exit the arena. Catalogue Corrections. The wonderfully produced catalogue apparently contained mistakes. Besides typos, some horses listed as 100% Crabbet were not, and some listed as 75% were full, this I was told by my friend who was in the stands and heard Peter Upton announce what was incorrect in the catalogue as he caught them. There could be other errors I am not aware of. Since these catalogues are still available for purchase (£12 or roughly $18 US), I would hope there is an addendum with the corrections included on future purchased catalogues, and I also hope that I am sent a correction list that I can post on the website for the many people, including myself, who own a copy and wish to update it with corrections noted. 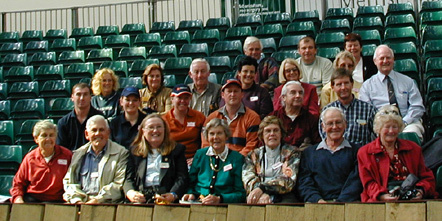 At the 2002 English Crabbet Convention, the panel of internationally-based speakers was comprised of Coralie Gordon from Australia, Betty Finke from Germany, Michael Bowling from the USA, Alexia Ross from the UK, Gari-Dill Marlow from the USA, and Peter Upton from the UK. I sat with my laptop computer the entire time taking notes, save for about three times when I got up and took photos of the speakers individually. Coralie Gordon spoke first. Her slide presentation presented a most interesting research into the early Crabbet imports to Australia and the breeders who brought them. Some of the breeders she discussed did not necessarily import Crabbet, but did much to further the bloodlines by purchasing some stock that had fallen in bad situations. This historical timeline of how Australia features in the Crabbet ‘scheme’ of things drives home the point that they have done much to continue the legacy of some of the best Crabbet lines, incurring extreme difficulties in obtaining these lines (distances in Australia taken into consideration as one factor) and have proven them in many competitive ridden areas such as work on ranches and endurance, plus their influence when bred to other breeds of horses. Her photo and pedigree slide presentation was very fascinating. I believe that statistics should be something that we spend time reading and memorizing, but not particularly used in a lecture forum because they tend to bore and confuse. Numbers, whether spoken or read, are in themselves cold and lifeless. For this reason, two speakers seemed either confusing, or presented information that appeared to not catch audience interest, particularly in its verbal formal. Gari-Dill Marlow read numbers off a sheet. These were hand outs given on the percentage of Crabbet blood in the US National Champion mares and stallions. 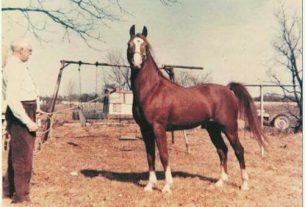 If read by newcomers to the Arab breed, they would have learned what most of us already know, and that is that most US National Champions have Crabbet blood behind them. Michael Bowling presented science in a way that came across to at least some of us lay people in a disjointed and misunderstood fashion. He projected paragraphs on the screen from a previous lecture (I imagine for geneticists), but dissecting it to just present the ‘simpler’ paragraphs to us while explaining how those few paragraphs relate to us as breeders. He stated, “Generic diversity buffers the breed against change; genetic diversity interacts with environment to provide the basis of all variation within a breed. Preservationist goal: promote the maintenance of diversity.” Well, if anyone understood this on the first go round, they did better than me. What I mainly got out of his lecture was that “once we lose it, it is gone forever.” That statement was profoundly obvious. Michael’s talk appeared to have been received with considerable confusion and a somewhat generalized inability to be understood. Alexia Ross admits that she is not a speaker and was there because she was asked to talk by the committee of which she is a member. Stepping up to the plate, she spoke about which Crabbet lines appear most in UK successful endurance horses and also showed the conformation pluses that should make for a good endurance horse. Her speech was brief, giving credit to Indian King, Ludo, and Dargee. Betty Finke is a knowledgeable writer with a fantastic memory. Her talk was on statistics of European champions carrying Crabbet blood. She was able to carry this off because of her fine photo presentation which illustrated her statistics and heightened interest. The disadvantage was that she didn’t use the microphone as she had her hands full with her notes and the slide projector remote control. Thus, some people in the back had trouble hearing her. Had there been a microphone stand, all speakers would have had easier access to their notes and the slide projector remote. The last speaker and crowd favorite was Peter Upton whose humor and slides inserted back to front livened up his topic which was primarily based on the promiscuity of Wilfrid Blunt graphically illustrated with a chronological dialogue of his mistresses. This was intertwined with slides of desert artwork done by Lady Anne, Peter’s own illustrations, and photos of various love interests of Wilfrid, which shaped Wilfrid’s writings and gave us an insight into his life. This provides a brief overview of the speakers and their topics. Klinta Bashir – 100% Crabbet Arabian stallion presented at the 2002 Crabbet Convention, England.